The nasal septum and the turbinates are normal parts of the nose. The nasal septum is the structure that divides your nasal passages into the right and left sides. A deviated septum refers to a septum that is crooked. The septum is made of cartilage and bone. The cartilage and bone of the septum are lined by a thin membrane called mucosa. This layer acts like a layer of skin for the inside of the nose. This layer covers and protects the cartilage and bone. It also helps to keep the inside of the nose moist. When the septum is deviated, one or both sides of the nose can become blocked. In these instances, surgery can help correct the deviation and improve airflow. Septoplasty is a surgical procedure to correct a deviated septum which is done to correct the inside walls of the nose. 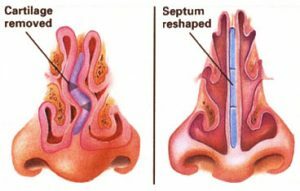 The septum has 3 pairs of long thin bones called nasal turbinates covered with thin tissue. Allergies or deviated nasal septum other nasal problems can cause the turbinates to swell and block airflow. Surgery can be done to fix blocked airways and improve breathing. An in office CT scan and picture of the nose can show the condition of the nasal septum. During a Septoplasty, Dr. Paciorek will straighten the cartilage and bone that have led to the septum being deviated. During the procedure, the lining (the mucosa) is first lifted off the cartilage and bone. The cartilage and bone can then be reshaped. Sometimes, portions of the cartilage and bone need to be removed. The lining is then laid back down. Nasal obstruction can be caused by a number of problems. For example, things like allergies can cause nasal obstruction. Another very common cause of nasal obstruction is narrow nasal passages. Often, narrow nasal passages are the result of problems with the nasal septum and turbinates. The turbinates are structures on the side wall of the inside of the nose. They project into the nasal passages as ridges of tissue. The turbinates help warm and moisturize air as it flows through the nose. 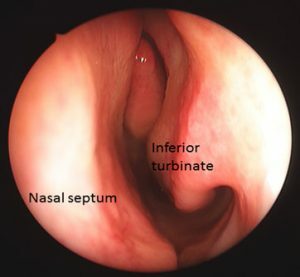 The inferior turbinates can block nasal airflow when they are enlarged. The diagnosis of enlarged inferior turbinates can be made with a thorough evaluation of your symptoms and nasal examination. Dr. Paciorek, may perform a procedure in the office called a nasal endoscopy to diagnose the cause of your nasal obstruction. Septoplasty and turbinectomy are done in a surgical facility like Camillus Surgery Center. There may be fatigue, nasal stuffiness, and mild nasal drainage after surgery. Pain is generally mild with this type of surgery and is typically well controlled with oral pain medications. The stuffiness typically results from swelling after the procedure, and typically generally starts to improve after the first week. There may have drainage of some mucus and blood from your nose after surgery. You may be asked to use saline sprays or irrigations after your surgery. You can expect fatigue, nasal stuffiness, and mild nasal drainage after your surgery. Pain is generally mild with this type of surgery and is typically well controlled with pain medications by mouth. The stuffiness typically results from swelling after the procedure, and typically starts to improve after the first week. You may have drainage of some mucus and blood from your nose after surgery. This is a normal part of the healing process.